Winston Churchill: It is a mistake to try to look too far ahead. 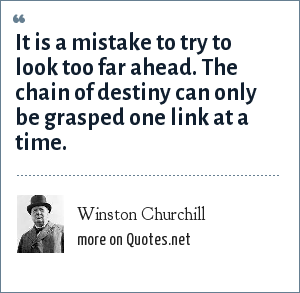 The chain of destiny can only be grasped one link at a time. "Winston Churchill Quotes." Quotes.net. STANDS4 LLC, 2019. Web. 23 Apr. 2019. <https://www.quotes.net/quote/5824>.